Granddad must have planted this tree in the 1920’s and is now on its last legs with rot in most main branches. But it’s still cropping massive apples. Mum use to stew them up, but I’ve lately found them good eating too. 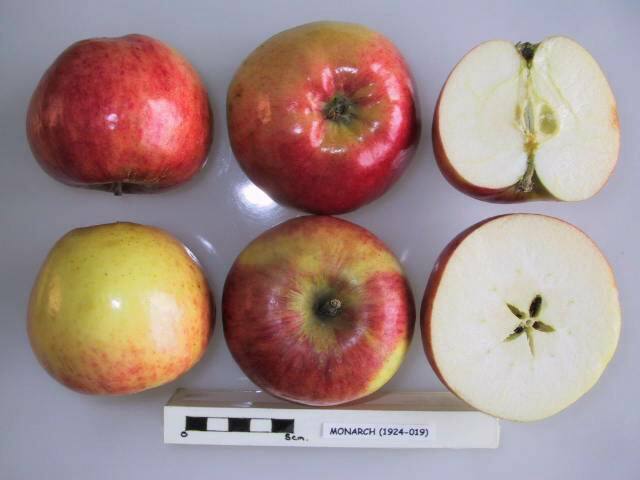 A codling moth is almost standard for each apple, but due to the size you can usually cut the bad bit out and still have a lot of apple. Never seen it in any nurseries so I will take cuttings and carry the tree on for my children. We have a young tree about 4 growing on the shores of a loch 200 miles north of Glasgow. This year the tree is laden so much that the branches are bending and I have ha to thin out the young fruit. Much appreciated since our growing season is short and early, this is delicious for cooking into a sweet puree. our Monarch which must be around 60 years old, is gradually dying. It is invaded by mistletoe and I have had to cut back large branches. 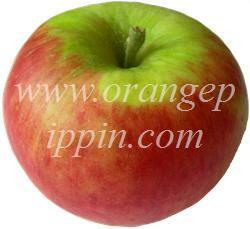 It still crops well though most apples are affected by something or other, scab, codling moth. The grandchidren climb it, it being a rite of passage to be able to get into it unaided except by managing a rope ladder to the lowest branch. I hope to replace it eventually with another monarch. I bought a flat in West Kensington from my brother in 1986 and was very pleased to have a greengage, a cherry and an apple tree in the garden. Now identified by Brogdale as a Monarch, this specimen, planted sometime in the late 70's I believe, is so enormous the occupiers of the first floor flat can pick the fruit from their kitchen window! Its crop is rarely disappointing and the fruit is delicious, in my view second only to a Cox. There is a belief that this tree has found a never ending water source as it is so vigourous. I echo other comments on this page and have to resist neighbours entreaties to chop it down!!! Wherever we live, our priority is to have a Seabrook's Monarch apple. My father planted this variety pre-WWII, so I grew up with it and introduced my husband to it at our first home on the Berkshire Downs. Twenty-two years ago we planted another tree at our new home near Winchester. The tree is not huge but it is regularly laden with sizeable fruit, keeping family and friends happy for months; comments like "remember the delicious flavour from last year" are usually forthcoming. For pies, purées, apple jacks and crumbles this well-named apple has no equal - and needs no sugar! Light, fluffy and full of juice, this variety cooks quickly and the important thing, when baking, is to score a ring around the apple's waistline, otherwise it will explode in the oven. From this, it may be deduced that I am a FAN!!! My father bought a plot of land with an orchard on it next to the Thames in Surrey. This was in 1961. After removing most of the old trees just one was kept. This old tree is now in a right old mess, split, full of what I think is canker and sometimes covered in a white blight, but it still produces massive crops. My mother who is 88 still enjoys using the apples in her cooking. for about 45 years none of us knew what the variety was until I gave one to a cider maker i know who identified it as a Monarch. The infomation I have gleaned is that this variety was very popular during the war as it didnt need as much sugar (rationed) as Bramleys. I beleive many were planted round the London area for Covent Garden. All the comments echo my own opinions of this great apple. It was already well established 30 years ago when we moved in and has been an absolute delight-- thank goodness I resisted my then young sons pleas to cut it down to give him room to play football. Very interesting comment from Mr Tyrlick. I read with interest the comments about the apple varieties. I too have 2 Monarch cooking apple trees which were bought at Boreham back in the 1980's from Mr Seabrook's Nursery. I am also the proud owner of several other apple trees bought fromthe same nursery, namely a Spartan, and 2 Cox's Orange Pippins. I too have been fortunate enough to have a splendid harvest of apples this year, and in the middle of picking them at this moment. My daughter was lucky enough to receive her degree by Mr Peter Seabrook at Pershore Horticultural College some 10 ? years ago. Happy apple picking everyone, and good cider-making for the lucky ones too! I grew up near to Chelmsford and we had this variety in the garden. Had no idea of its local origins. Agree with the other contributors - an under-valued variety in my view. I have read the preceding comments on the 'Monarch' and am privliged to say I am sitting next to the grandson, of the original and first grower of this splendid variety. W.P. Seabrook of the nurseries Boreham Chelmsford, Essex was the original propagater of this variety. Mr. B. Seabrook the youngest grandson is delighted to read that people are still enjoying the fruit of his grandfathers labour. The oldest grandson W.T. Seabrook is currently residing on the family property in Chelmsford, he is very knowledgable and is still actively involved in the apple industry. After 34 years of wondering what is the variety we have in our garden Brogdale has named it as Monarch and what everyone says about it is 100% true! A splendid cooker and a very sought after fruit by all our neighbours especially by those who bake it. I think the Monarch apple tree in the garden of my 1930's semi is nearly as old as the house. It has a huge crop this year after a poor 2007. No-one else seems to have heard of the variety, but I think it tastes much better than Bramleys and is much more attractive looking as well. Had a really good crop this year and have already filled my freezer ready for pies, crumbles etc later in the year. This apples also makes a great apple butter (good with all hot or cold meats and also on bread!) and apple and sage jelly. Am experimenting with juicing some of the apples which, at first tasting, is great. I have one of these in my back garden. The house was built in 1936 and I understand they were heavily promoted during WWII as they didn't need much sugar. Excellent baker, beautiful in crumbles - everyone I give some to asks for more with comments like "just how I remember apples to taste". Very heavy cropper (when neighbours aren't cutting branches!!). Climbing the tree to get them is a tradition for me. Would recommend if you can get hold of one. Inherited a Monarch 34 years ago great flavour, crops and stores well into the Spring.Find the best fruit from the top of the tree which ripens well are excellent eaters. A good all rounder!! Having sold my late father's house recently I am so going to miss the autumn harvest of Monarch apples from his tree. Great for cooking, store well right through to Spring, also good as eaters once well ripened. Generous cropper most years. A smashing variety and our favourite.